It’s time to make shooting comfortable. AAE Archery and Astra Archery are happy to present the KSL Finger Tab. The cutting-edge design pioneered by KiSik Lee represents a breakthrough in comfort, ergonomics, and feedback. Every swooping curve, bend, and edge has been designed to mimic the contours of the shooting hand while prompting correct technique and providing a secure fit. A dense, heavier brass option is available for archers wanting a heftier feel. Gone are the days of worrying about positioning the tab just so from shot to shot – the KSL Finger Tab fits like a glove every time. The included shelf can be attached if the archer so chooses. The adjustable ergo-palm plate can be moved up, down, forward and backward to achieve the perfect fit in the hand for comfortable, pinpoint accuracy. Smaller fore and aft positioning of the finger spacer is accomplished by the finger spacer adjustment screw and slot. Dialing in a perfect fit has never been so easy. Finger spacer adjustment holes allow for large fore and aft positioning of the finger spacer. A relief cut traps the elastic finger webbing for secure attachment. 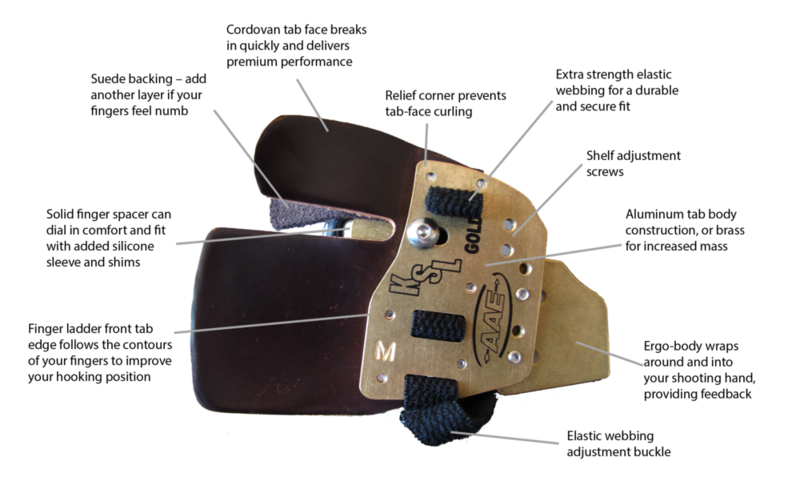 The ergo-palm plate’s unique shape fills the contours of the shooting hand when it is curved, holding a bow at full draw. The ergonomic design is an industry first. This is a picture of Brady Ellison's finger tab. The KSL Finger Tab proudly wears KiSik Lee's initials, signifying not just his endorsement, but the implementation of his design and coaching ideology behind this revolutionary product – the first prototypes were designed by him at the US Olympic Training Center in early 2007. Download a high resolution pdf of Inside the Archer : Chapter 4 - Hooking, to aid in using the AAE KSL Finger Tab. Technique secrets within!